However, Microsoft Word 2010 seems to offer no way to support this. I've searched everywhere I could and all tutorials show how to create either footnotes, or the second scenario presented above. Please let me know whether it's possible for me to do what I am trying to. I have figured out the answer. The style of Reference page I would like to use is called IEEE. In the Citations and Bibliography section of the References tab, there is a menu for Style. If you select that, IEEE is one of the options. Enter the source into the wizard page. Click OK. Now your citation is in the list when you click "Insert Citation". Whenver you reach somewhere in the document where you want to refer to that reference, click Insert Citation and select it. When you are ready, generate a Bibliography by clicking Bibliography > Insert Bibliography. NOTE: If you don't see the IEEE format as an option, you need to install it, as @Kesavan points out below. If the link he provided didn't work, go HERE, download styles.zip, unzip it, then copy all the .xsl files (each representing a different style) into the folder C:\Program Files (x86)\Microsoft Office\Office12\Bibliography\Style or equivalent on your machine. Look in Insert -> Indexes and Tables -> Index and Table... then under type select Bibliography. You can then customise the options quite a lot. You can specify which fields are used for the entries in the Bibliography and in what order for the different types of bibliography entries that are pre-defined. When you want to add a reference in a document use Insert -> Indexes and Tables -> Bibliography Entry. Not the answer you're looking for? Browse other questions tagged microsoft-word reference-book or ask your own question. 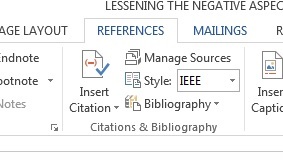 How do I set MLA citation style to use numeric reference in MS Word 2007? How can I stop Microsoft Word from changing my APA citations?